10.1907: Launched by Dundee Shipbuilding Co Ltd, Dundee (Yd.No.194) for Mrs Ann Harries, Neyland (managing owner) as HERO. 21.11.1907: Registered at Milford (M218). 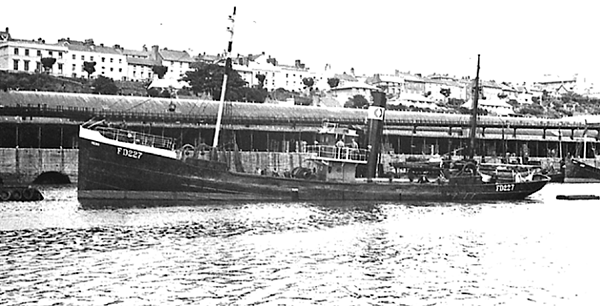 1911: Sold to Neyland Steam Steam Trawling & Fishing Co, Neyland. Alexander Scott, Llanstadwel designated manager. 8.1914: Requisitioned for war service as a minelayer (1-6pdr HA) (Ad.No.156). 1917: Fitted out as a minesweeper. Based Dover. 31.1.1919: Sold to Noah Ashworth, Rowland Morris & Ernest Taylor, Fleetwood. Joseph A. Taylor designated manager. 18.7.1919: Registered at Fleetwood (FD227). 18.11.1919: Sold to The Clifton Steam Trawlers Ltd, Fleetwood. Joseph A. Taylor designated manager. 1920: Returned after restoration and survey at Cowes. 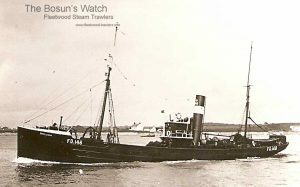 23.2.1936: Sustained damage in collision in Wyre Channel with steam grab dredger ROSSALL (239grt/120) and steam trawler DINAS (FD63). 4.5.1939: At Fleetwood landed a sturgeon, 4ft 2inches long weighing 2 stone. Bought by Messrs Broughton & Co who had received an order for such a fish from the Royal Household. Despatched to London immediately to be put onboard the Empress of Australia (21,833grt/1913) to be served during their Majesties crossing of the Atlantic prior to the Royal Tour of Canada. 6.1940: Requisitioned for war service as a minesweeper (P.No. FY1866) and renamed HEROINE (Hire rate £56.10.0d/month). 4.1944: Fitted out for smoke making (Esso) trawler and assigned to Operation Neptune – Normandy landings. 9.6.1944: Sailed Solent for Mulberry B with Group B2 as part of Convoy ETC6. Employed smoke making. 27.11.1944: Returned and reverted to HERO (FD227). 3.10.1945: Sold to John Yolland Jnr & Others, Milford Haven. 14.3.1946: Sold to William D. Uglow & Samuel F. Uglow, Milford Haven. William D. Uglow & Co designated managers. 1951: Sold to William James (Milford Haven) Ltd, Milford Haven. Hubert S. Smith designated manager. 1952: Sold to Yolland Brothers Ltd, Milford Haven. J. Yolland designated manager. 3.1953: Fishing off the Irish Coast (Sk. Lenny Brown). Developed boiler trouble and tow requested. CLOUGHSTONE (H374) (Sk. 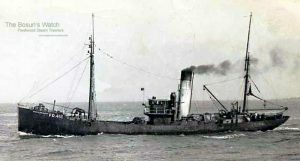 Bert Horst) connected and commenced tow to Milford. 18.5.1953: Fishing off the Smalls (Sk. C. Shearing). At about 8.00 a.m. hauling in dense fog 30 miles West of the Smalls Lighthouse run down by steamer RIVERCREST (7008g/1944) on passage Liverpool-Casablanca, and foundered. Eleven crew *picked up from water by RIVERCREST but one man died +. Crew landed at Milford. (* Sk. Charles Shearing; G. Stammer, Mate; G. Burder, Bosun; J. Owen, Third Hand; Chief Eng. A. Scales; 2nd Eng. R. Mallett; fireman J. Canavon; deckhands. G. Snelling & J. Harries; cook. R. Leckie. 24/01/2009: Page published. 3 updates since then. 13/07/2017: Removed Peter Brady image and updated information. This entry was posted in Lost Vessels, Steam Trawlers, Steamers (Picture) and tagged Ashworth Morris & Taylor, Clifton ST, Lost on January 24, 2009 by Fred Smith. 18.3.1915: Launched by J. Duthie Torry Shipbuilding Co, Aberdeen (Yd.No.415) for The New Docks Steam Trawling Co (Fleetwood) Ltd, Fleetwood. as ERNA. 17.5.1915: Registered at Fleetwood (FD158). 5.1915: Completed (Joseph A. Taylor & Ernest Tomlinson, managers). 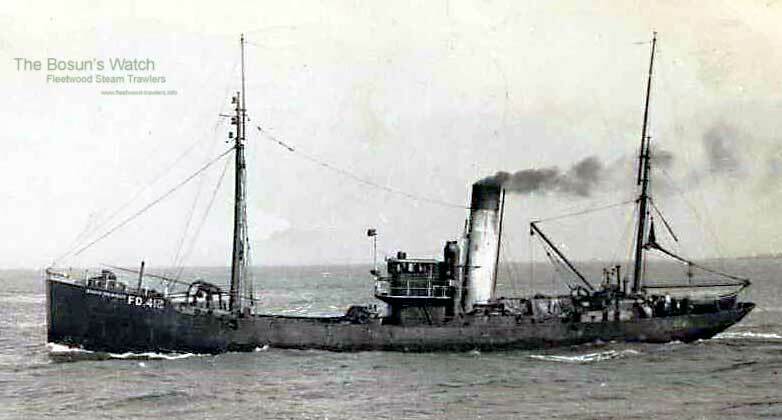 Requisitioned from the builder and fitted out as a minelayer and later a minesweeper (1-6pdr HA) (Ad.No.1586). 23.2.1916: Attached to Unit.104, Dover Patrol, picked up one crew member of steamer SEA SERPENT mined in Channel. 1.4.1916: Sweeping with PRINCE LEO (GY920)(Ad.No.1634), caught German submarine in sweep wire. Destroyer exploded depth charge over wire and trawlers freed, but could not determine if submarine was destroyed. 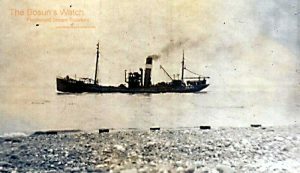 8.6.1930: In Wyre Channel, one of 23 trawlers inbound, attempted to pass grounded steam trawler NELLIE BRADDOCK (FD175) aground on Tiger’s Tail off lock pit, came fast and completely blocked channel. Refloated on next tide and entered Wyre Dock. 27.9.1930: Stripped propeller on way home from fishing grounds. Steam trawler THE ROMAN (FD151) connected and commenced tow to Fleetwood. 12.1938: Sold to The Clifton Steam Trawlers Ltd, Fleetwood. 9.1.1940: Requisitioned for war service and appointed as a boom defence vessel. 1.2.1940: Requisitioned for war service as a boom defence vessel (P.No. Z.112) (Hire rate £94.15.0d/month). 1944: Based at Portsmouth (Fraser & White Ltd, agents). 1948: Laid up pending survey. 1948: Sold to Salvedor Co Ltd, London (Philip Bauer, manager). 23/01/2019: Page published. 5 updates since then. 03/09/2017: Removed FMHT watermark from image. This entry was posted in Steam Trawlers, Steamers (Picture) and tagged Clifton ST, New Docks STC on January 23, 2009 by Fred Smith. 1919: Launched by J. P. Rennoldson & Sons Ltd, South Shields (Yd.No.314)(“Castle” class) for The Admiralty as DANIEL DILLON (Ad.No.4484). 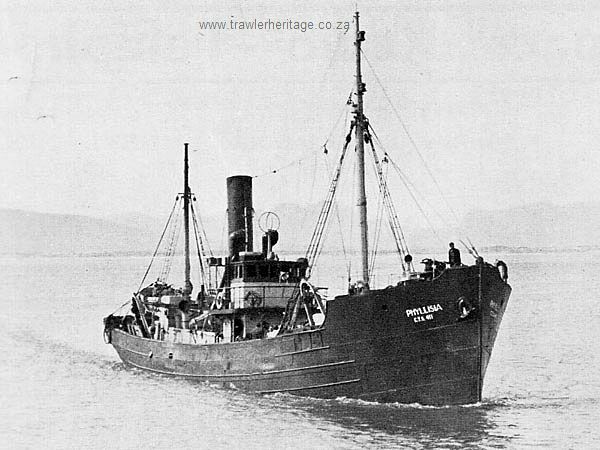 28.7.1919: Completed as a fishing vessel and sold to Soc. Anon-Delta, Ostend (J. Nierinck, manager). Renamed EDOUARD NIERINCK (O206). 1922: Sold to Jules H. Nierinck, Blackpool (managing owner). 5.10.1922: Registered at Fleetwood (FD412). 1924: Sold to Scarisbrick Steam Trawlers (Fleetwood) Ltd, Fleetwood (William W. Brierley, manager). 1924: Registered at Fleetwood as EDWARD WALMSLEY (FD412) (BoT Minute M/RG 1480/24). 18.10.1935: Off the Western Isles in very heavy weather (Sk. George Abram*) observed rockets and flares from a vessel in distress. Steamed towards vessel and found steam trawler DHOON (FD348) disabled with severe heavy weather damage. 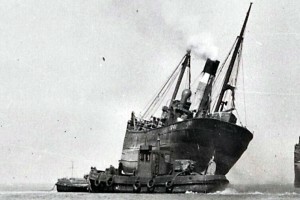 20.10.1935: At 7.00am after almost twelve hours and many attempts, continuously swept by heavy seas, connected and proceeded for Fleetwood. 22.10.1935: At 4.20am. arrived Fleetwood after a very difficult 48 hour tow and delivered alongside at North End. Later landed 104 kits – 100 boxes 20 baskets, £359 gross. 30.8.1939: Requisitioned for war service as a minesweeper (P.No. FY.624) (Hire rate £86.5.0d/month). 7.1946: Reclassed at Fleetwood and returned to owner. 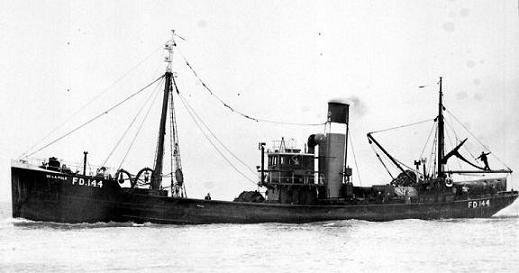 27.9.1949: One of five trawlers that went aground in the Wyre Channel in thick fog when outward for the fishing grounds. Refloated next tide and proceeded. 12.10.1949: Landed 308 kits, £1460 gross. 1952: Sold to The Cevic Steam Fishing Co Ltd, Fleetwood (Richard Neave, manager). 1958: Sold to Haulbowline Industries Ltd, Passage West, Co. Cork for breaking up. 24.11.1958: Sailed Fleetwood for Cork. * 16.1.1935: Sk. George Abram presented with a Board of Trade silver bowl in recognition of the skilled seamanship and persistence shown in assisting the Dhoon). 23/01/2009: Page published. 5 updates since then. 25/04/2017: Removed FMHT watermark from images. This entry was posted in Steam Trawlers, Steamers (Picture) and tagged Castle, Cevic SFC, Clifton ST, Jules H. Nierinck, Killen SFC, Scarisbrick Steam Trawlers on January 23, 2009 by Fred Smith. 1918: Launched by Cochrane & Sons Ltd, Selby (Yd.No.846) (“Mersey” class) for The Admiralty as SAMUEL JAMESON (Ad.No.3839). 20.9.1918: Completed (1 – 12pdr and W/T). 1926: Sold to Sam Robford & Co Ltd, London. 12.3.1927: Registered at Fleetwood as LOUGHRIGG. (FD148) (Keith R. Hoare, London, manager). 27.2.1928: Sailed Fleetwood for St. Kilda with mails (11 bags). Could not locate island due to dense fog, eventually anchored in Village Bay and islanders came out. Very short of flour and other provisions. 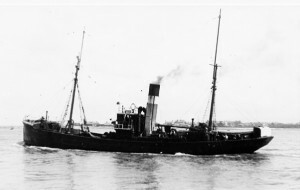 8.3.1928: Returned Fleetwood, coaled and took on provisions. 9.3.1928: Sailed Fleetwood for St. Kilda. 1929: Sold to The Clifton Steam Trawlers Ltd, Fleetwood (William W. Brierley, manager), managers). 21.8.1929: Registered at Fleetwood as PHYLLISIA (FD148). 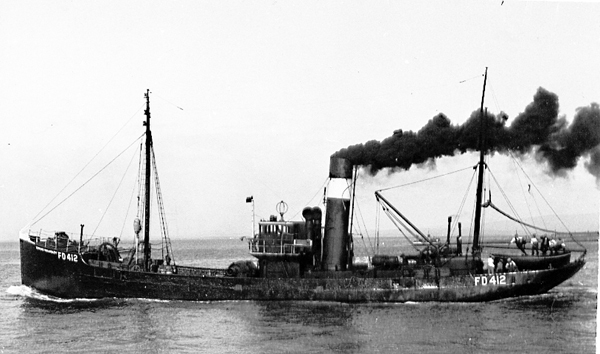 27.3.1930: Sold to New Docks Steam Trawling Co (Fleetwood) Ltd, Fleetwood (William W. Brierley, manager). 17.7.1939: Sold to The Clifton Steam Trawlers Ltd, Fleetwood. 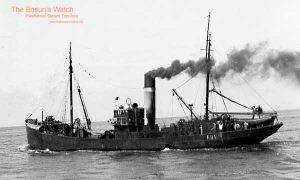 12.11.1939: When homeward off St Kilda, closed by U-boat (U.41) which had onboard survivors from steam trawler CRESSWELL (M129) which she had shelled and sunk two days previously 18 miles NW by N of the Islands. Took onboard survivors, seven in number. 4.12.1939: Requisitioned for war service as a boom defence vessel (P.No. Z.144) (Hire rate £97.4.0d/month). South Atlantic Command. 16.11.1942: Transferred to West Africa Command. Based at Freetown, Sierra Leone. 8.10.1943: On loan to Portuguese Government (P.No.B1). 23.11.1943: Compulsorily acquired by M.O.W.T. Remaining on loan to Portuguese Government. 19.8.1945: Returned to M.O.W.T. Based at Plymouth (W. Tamlyn Ltd, Plymouth, agents). 6.1946: Surveyed and restored at Plymouth. 7.1946: Sold to East Fisheries Ltd, Cape Town. Registered at Cape Town (CTA121). 7.9.1952: Sold to South African Navy. Stripped of all useable parts and non-ferrous metals and used as a target. Subsequently scuttled off Robben Island. 22/01/2009: Page published. 6 updates since then. 29/08/2017: Removed FMHT watermark from image. This entry was posted in Lost Vessels, Steam Trawlers, Steamers (Picture) and tagged Clifton ST, Lost, Mersey Class, New Docks STC on January 22, 2009 by Fred Smith. 1.5.1919: Launched by Cook, Welton & Gemmell Ltd, Beverley (Yd.No.415)(“Castle” class) for The Admiralty as JOSHUA ARABIN (Ad.No.4299). 26.8.1919: The Admiralty (Director of Contracts) letter giving Charles F. Paton, Glasgow the option to purchase twelve steam trawlers at a price of £182,000. 9.10.1919: Completed as a fishing vessel. 21.10.1919: Option transferred by Charles F Paton to The Montrose Fishing Co Ltd.
1919: Sold to The Montrose Fishing Co Ltd (64/64), Montrose. Charles F. Paton, Glasgow designated manager. 26.12.1919: Registered at Montrose (Part I & IV) as JOSHUA ARABIN O.N.144161 (ME67). 23.3.1920: Registered at Montrose as RIVER FORTH (ME67). 26.8.1921: Extraordinary general meeting called for the purpose of considering resolutions for the voluntary winding-up of the company, and the selling, by the liquidators, of the business and property of the company to a new company proposed to be formed with a name nearly as may be the same as that of the present company. Further finance to be arranged. Vessels laid up. 9.1921: Some vessels returned to fishing. Harry A. Holmes, Aberdeen designated manager. 10.5.1922: Company in voluntary liquidation; deficit about £100,000. Mr James Winning, chartered accountant, Glasgow appointed liquidator on advice of National Bank of Scotland Ltd the largest secured creditor. 5.10.1922: Sold by the liquidator to Melling Trawlers Ltd (64/64), Fleetwood. Henry Melling, Preston appointed manager. 1.11.1922: Registered at Fleetwood (FD417). 18.11.1922: Registered at Fleetwood as LENA MELLING (FD417). 13.1.1925: Assisted Liverpool steamer AQUILLA (450grt/1907) in Ramsey Bay flooded and without steam. Towed to safety. 1931: Sold to William C. Farrow (64/64), Hull. 12.1931: Sold to Farrow’s Steam Fishing Co Ltd (64/64), Hull. William C. Farrow & George Altoft designated joint managers. 21.12.1931: Registered at Hull (H395). 18.1.1932: Registered at Hull as De La POLE (H395). 23.8.1933: Sold to Hudson Steam Fishing Co Ltd (64/64), Hull. Archibald Hudson, Hessle designated manager. 19.10.1933: In strong SSE wind disabled with fouled propeller. Trawler ALMANDINE (H415) connected and delivered Hull. 12.11.1935: Sold to Harry Eastoe Rees (64/64), Milford Haven. Harry Eastoe Rees designated managing owner. 9.12.1935: Registered at Milford (M195). 1.9.1939: Sold to Henrikson & Co Ltd (64/64), Hull. Olaf Henrikson designated manager. 13.11.1939: Registered at Hull (H234). 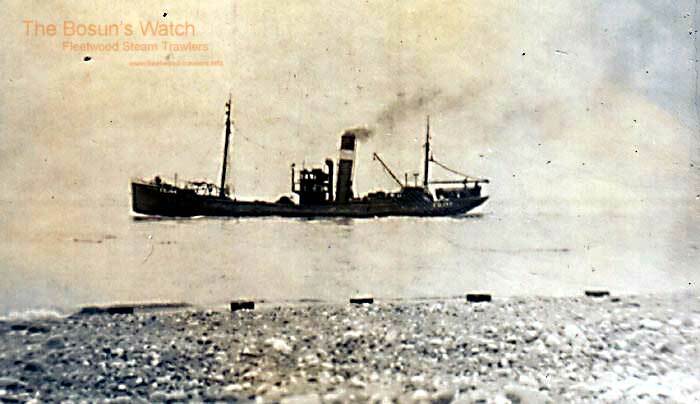 27.5.1940: Requisitioned for war service and as an anti submarine trawler (P.No. 4.129). 6.1941: Fitted out as a minesweeper (P.No. FY.558). 13.2.1944: Sold to The Clifton Steam Trawlers Ltd (64/64), Fleetwood. 13.12.1945: Registered at Fleetwood (FD144). 19.12.1945: Returned to owners after being re-classed at Liverpool. 7.7.1952: Sold to Boston Deep Sea Fishing & Ice Co Ltd (64/64), Fleetwood. Fred Parkes, Blackpool designated manager. 24.1.1953: Landed and laid up. 1955: Company re-styled Boston Deep Sea Fisheries Ltd, Fleetwood. Fred Parkes, Blackpool appointed manager. 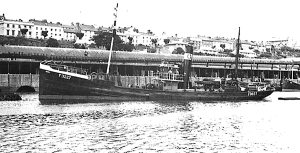 11.1956: Transferred to Milford (W. H. Kerr (Ship Chandlers) Ltd, Milford Haven, managing agents). 4.6.1957: Last landing at Milford. 1957: Sold to BISCO and allocated to Thos. W. Ward, Sheffield for breaking up. 2.7.1957: Arrived Castle Pill, Milford Haven. 20/04/2017: Removed disputed image and added another. 08/01/2018: Removed FMHT watermark from image. This entry was posted in Steam Trawlers, Steamers (Picture) and tagged Boston DSF, Castle, Clifton ST, Melling ST, Parkes on January 22, 2009 by Fred Smith.